On Saturday (July 11th 2015) between 4.50pm – 5.00pm two Malay youths were apprehended by Oppo salesperson(s) while allegedly running away after stealing a phone from another store at Low Yat Plaza. One was released and later returned at night (7.50 pm) with other youths to take revenge on the Oppo store and salesperson(s) involved . Video footage of the fight started to go viral later that night. The majority of users were sharing the video and expressing surprise. Few users openly expressed support/respect for the Malay youths involved in the initial fight on Saturday. 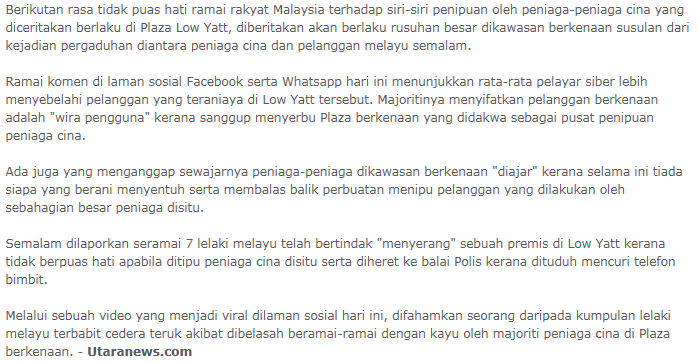 There were more users commenting that Low Yat traders (specifically Chinese) were known to be cheats. On Sunday (July 12th) there was little discussion about the incident on Twitter. Starting at 4pm a link to a blog post (http://www.utaranews.com/2015/07/rusuhan-besar-akan-berlaku-di-low-yatt.html) was tweeted out stating that there was going to be a riot at Low Yat Plaza ‘soon’ allegedly ‘in retaliation to cheating by Chinese traders’. The source for this news was not stated, and the link was tweeted out together with hashtags #melayubersatu and #kekalnajib. On Sunday night at 7pm a large group of Malay youths gathered outside Low Yat Plaza and tried to gain entry. However they were stopped by police and ordered to disperse. After midnight they returned and started to begin fights outside Low Yat . Five people were injured  and a car was badly damaged by the rioters.